Grading modern proof coins is done quite differently than business strike coins and classic proof coins. Modern proof coins are usually defined as coins made after the early 1960s. This classification is mainly because United States coin composition changed in 1965 and The United States Mint was developing modern minting technology in the 1960s and 1970s. 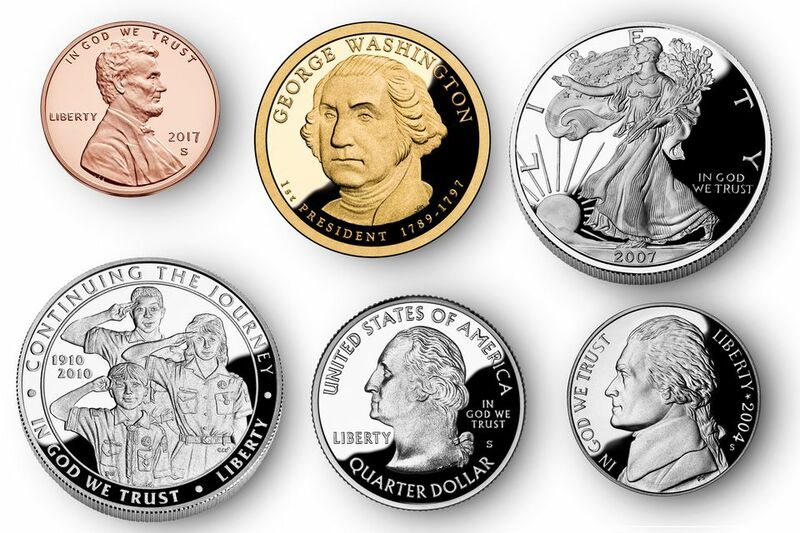 These new developments led to significant improvements in the quality of proof coins produced by The United States Mint. Most modern proof coins made over the last 25 to 30 years will almost always grade between PR-68 and PR-70. More recently, at least 95% of modern proof coins grade PR-69 or better. The differences between these two grades are minimal and require proper magnification to see any defects that will only appear under specific lighting conditions. Most commonly the difference between PR-69 and PR-70 is "eye appeal." Eye appeal is the overall appearance of the coin taking into account all aspects of the visual appearance of the coin. A modern proof coin that grades Proof 70 has no visible defects, even under magnification using a 5X to 10X magnifying glass. There are no hairlines, lint marks, planchet flaws, spots, specs nor stains visible on the coin under magnification. 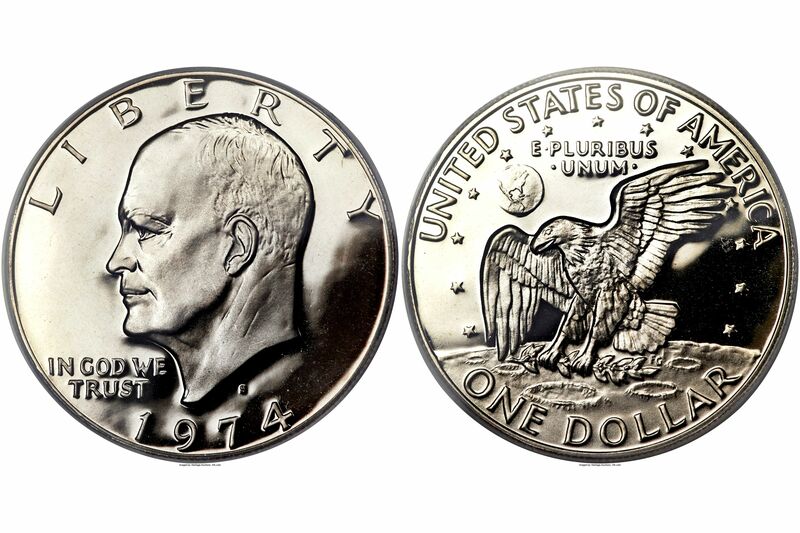 Additionally, there will not be any rub marks on the frosted high points of the coin. The coin must have outstanding visual eye appeal and exceptional cameo contrast. Many people cannot tell the difference between a Proof 70 and a Proof 69. This is mostly because they have not looked at enough proof coins to tell the difference. Looking at photos of modern proof coins will not help you. You must be able to look at professionally graded examples in the holder to be able to tell the difference between the two grades. If a modern proof coin has all the qualities of a Proof 70 coin, but it has a very small (almost microscopic) spot or stain, this will qualify it for a Proof 69 grade. Additionally, there may be one or two small hairlines but definitely not patches of hairlines. Otherwise, cameo contrast and eye appeal must be outstanding to achieve the Proof 69 grade. Many coin collectors will believe that there Proof 69 coin should've received a grade of Proof 70. Usually, they fail to see the small hairlines that will drop a coin from PR-70 to PR-69. First of all, the lighting conditions must be perfect. This means that you should be sitting in a dark room with no windows (or shades are drawn) to prevent any outside light sources from entering the room. Use an ordinary desk lamp with a 75W incandescent bulb positioned approximately 18 inches above the coin. Use a 5X to 10X magnifying glass and look at the coin from different angles. Usually, hairlines will start becoming visible when holding the coin at a 45° angle to the light and your eye. Rotate the coin under the light and look in the mirror-like fields for small hairlines. Some discoloration, small spots or light stains may be visually apparent on the coin. These imperfections will usually impact eye appeal to the point where it is not optimal for similar type coins. If small problems are visible with the naked eye, this will usually qualify the coin as Proof 68. However, the issues must not be significant to the point where the coin would be considered an impaired or damaged proof. Pay attention to the mirror-like fields and look for patches of hairlines. Use the lighting method described above in the description of Proof 69. Make sure you use a magnifying glass and rotate the coin under the light. Look at both sides of the coin to confirm your grade. Sometimes a spot or two may be hiding in more complex areas of the design. For example, a spot on Roosevelt's ear on a dime may not be as apparent as a spot on his cheek or four head. Make sure you inspect all areas of the design for any imperfections. Larger stains or spots that are visible with an unaided eye will usually force a coin into the Proof 67 grade. Eye appeal will be less than optimal because problems will be noticeable to the naked eye. There will be small patches of hairlines in the mirrored fields or other imperfections that will be quite visible. Usually, the number and/or size of imperfections on the coin is what would keep a grade in Proof 67 from grading any higher. Make sure you inspect the hidden parts of the design for defects that may not be as obvious. Use proper lighting and a magnifying glass to check these areas. Proof 66 is the lowest grade that most collectors would consider purchasing a modern proof coin. There will be large stains or spots plainly visible to the naked eye. Overall eye appeal is lacking, and the imperfections on the coin are distracting. There will be many small patches of hairlines and spots detracting from the overall look of the coin. If the problems are too numerous and visually disturbing to the appearance of the coin, it will receive a lower proof grade, and most coin collectors will consider it a "problem coin." What Are Coin Grading Qualifiers or Designations? What Is "Cameo Contrast" and Proof Coins?